An irresistibly feminine design with soft layers and razored edges. • Overall Length: 18 in. 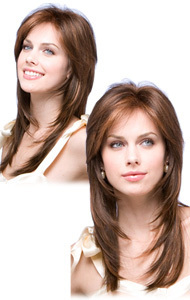 A precisely layered cut with feathery fringe creates glamorous volume. A gorgeous foot and a half of long, layered, European-waved tresses for the ultimate in glamour. Also available in Human Hair. Long and stunning; graceful interior layers create a soft silhouette with maximum movement. • Overall Length: 25 in. Modest waves in a perfectly flattering cut that any woman can wear. 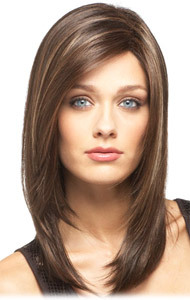 Long, soft layers with great movement. Long, flowing layers that evoke a feminine, sensual essence. Features Monofilament Plus, a fine base material with sensitive skin guard and tape tabs.